The below mission and image from Test Mile is different and a trigger to unspoken thoughts. I wish to share my interpretation about this image. Mission: Analyze the attached image which is a part of advertisement + awareness campaign by Test Mile. What does the slogan - "Together We Cover. Divided We UnCover" mean to you as a tester? There are various visual clues in the picture as well. We would love to hear how you relate the story of this image. "Together", "We Cover", "Together. We Cover"
"Divided", "We UnCover", "Divided. We UnCover"
Illusion of diverting roads showing two lanes. Not sure how many lanes each road has. Lane marking looks quite similar in two roads in size, color, and appearance. The side of road is marked by two parallel lines which looks as yellow-in-color. And it diminishes with size and color in left side road as it proceeds further. Right road does not show this indication. Not sure how many roads brought these two diverting roads. The left road shows 'Development' and right road shows 'Testing'. Blue sky kind of visuals with four clouds. I can see just four clouds in the snap; it can have more than four as well. The clouds are placed in different places. Looks like one cloud resemble just one other cloud in appearance and size. Similarly the other two looks alike in appearance. Visibility of one cloud is not so prominent but it looks as though it is touching green area with high hue brightness. And it appears to be clear early morning sky. There is a smoke or skew line structure between clouds; may be this is too cloud. These skew line cloud connect all other clouds though it is thin and slightly invisible to look at. Along the side of roads, looks like human kind of objects standing opposite to humans on other road. Just few are trying to interact or standing close by at point where diversion of road starts. As the diversions gets broader, people are placed far way from who are on other side. "Divided. We UnCover" is shown on green land. The text is in color that looks as white. "Together. We Cover" is shown in the air. The text is in color that looks as black. Green land at right hand side has a heap kind of surface. Left side road does not have this structure surface. Why the word is written as "UnCover" instead of "uncover" ? What is being said to uncover? What is being said to cover? 'Uncover' is shown in the green land and 'cover' is shown to be in sky. I relate this to development of testing and clouds to five schools of software testing. The five schools of software testing what I have come across -- Analytical, Standard, Quality, Context and Agile. The four clouds are Analytical, Standard, Quality and Context Driven school of testing. The cloud that is passing through all these four clouds is Agile. Each of these school has its principles and students who does not listen or not show the ear for other schools of testing. This is leading to disrespect among the testers and showcasing 'Testing and Software Testing' in software industry is not big deal. Between this happening, a buzz word 'Agile' is floating around and making Agile Development (agile programming and agile testing) is the solution which is smartest to today's business. While we testers (who adds school name with them) keep arguing and disrespecting each other for their respective approach and testing practices, how do we uncover the existing myths, problems and misunderstanding in green land of testing? While we are unable to uncover in little green land what we have got in software industry, how we do cover the testing essence which is as wide as sky? We all testers divided, we fail to uncover the problems and hurdles that are blocking our Software Testing Profession to be the respected one. While we are together, we cover though it as wide and height as sky is. 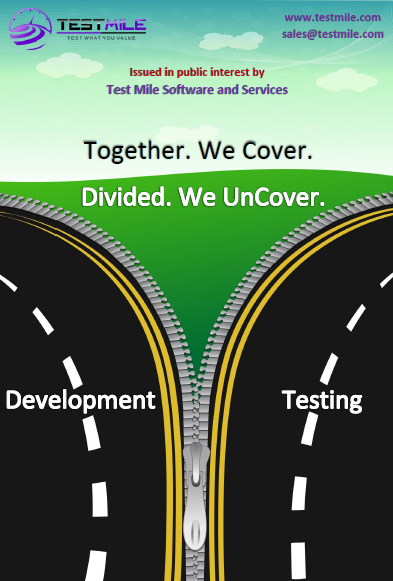 Testers, divided we are, we will not uncover anything; together we stand and work, we cover unimaginable so the Software Testing excels. Isn't this beautiful picture from Test Mile? Before we testers going and making programming better, we make our software testing to have its stand along with programming. Rahul, I personally feel the image speaks a lot in different perspectives. I wrote above perspective. Thanks for giving this exercise.